W. E. W. 'Teddy' Petter of English Electric, in the midst of designing their P.1 fighter type that would go on to become the Lightning, was having misgivings about the direction fighter design was going in - the P.1 was coming up to a weight of 25,000lbs - three times the weight of a Mk.14 Spitfire, and that was before the addition of a decent fuel or weapon load. With weight and size came expense, and Petter increasingly believed that lightweight and low cost designs would be more sensible. Unable to pursue this vision at English Electric, he left to become Managing Director at Folland. To combat the expected Soviet bomber squadrons, the F3/48 specification for a new fighter had been issued (resulting in the Swift and Hunter) but Petter believed a smaller, lighter aircraft - perhaps even with detachable engines - could fulfil this fighter role. He managed to drum up some interest, and so work on a lightweight fighter type began. Initial thoughts were of something akin to the rocket-powered Me-163 Komet, desperately thrown up against USAAF B-17s in the closing stages of WWII. The expected target for this type of fighter would be hordes of Soviet Tu-4s - copies of the B-29 Superfortress, armed with nuclear gravity bombs and able to reduce most of the UK to ash by this time - 1951. By the time an operational requirement was issued - OR.303 - the rocket fighter idea had apparently been given up on, but no choice had been made on powerplant and discussions with Folland continued as to details such as armament and fuel capacity. Rolls-Royce soon pulled out of the job of providing any sort of detachable engine, and this left Petter frustrated with the lack of progress - as well as with opposition to the project from within the Air Ministry, who had failed to provide any sort of financial backing to any other engine manufacturer. Eventually just to get things going Petter went with the Armstrong-Siddeley Viper, a promising new engine that would be suitable for a small prototype to test out the basics of the lightweight fighter design. 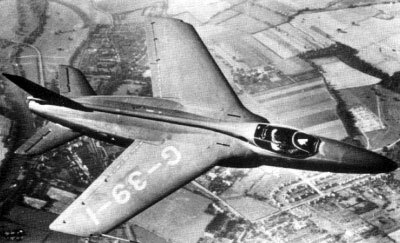 Earlier envisaged as a T-tail design with rocket armament, Petter's experience with the P.1A resulted in him changing to a low tailplane, and now the Air Ministry decided the design would be unsuitable - as they felt it could not carry guided missiles, which hadn't been mentioned previously! The Me-163 style rocket interceptor plans now made a re-appearance, but Petter decided not to participate in yet another paperchase and instead left Avro and Saunders-Roe to submit designs for the F.124T specification (which ended up going nowhere). By now both Hunter and Swift had flown, and official opposition to Petter's stubborn ideas on a lightweight fighter seemed to spell the end for the project. So, Folland went ahead and produced the Midge anyway. With a roll-out date of 31st July 1954 set by Petter, the aircraft was duly rolled out on schedule and engine runs made at Hamble, where it had been produced. Transported to Boscombe Down for three initial test flights, it first flew on the 11th of August and by the 21st was based at Supermarine's airfield at Chilbolton. Flight testing went very successfully compared to the Swift and Hunter, and the Midge even appeared at the Farnborough SBAC show in September. By the end of September the A&AEE at Boscombe had made a preliminary evaluation of the type and agreed that it showed considerable promise. Indian Air Force observers (at Chilbolton to evaluate the Swift) also showed interest with the result that they recommended to their superiors that a purchase of the Midge's larger development - the Gnat - should be made. Petter had finally struck it lucky on the engine side of things, because Bristol had gone ahead the year before with a privately funded project for a new engine which would be eminently suitable for the Gnat design. This would become the Orpheus, and its larger size compared to the Viper meant that the Gnat, as well as having the larger wings already decided upon, would now have a wider fuselage than the Midge. Still no real support was being shown for the design, so the 1954 NATO fighter competition came as a valuable opportunity to push the Gnat. Of the five entrants, the Gnat was consistently placed last by the judges - primarily, it seems, because it did not have low pressure tires for rough airfield operations. Petter refused to compromise by introducing bulges on the fuselage to cater for these larger tires, and so the Gnat lost out - despite being the only one of the five entrants that actually qualified under the competition's weight rules! The Fiat G.91 was eventually selected, but only saw Italian and German service, with the British and French refusing to have anything to do with it. Despite opposition within the Air Ministry approval was now gained for the production of a small batch of development Gnats; while it was stated that the RAF would not be interested in this initial Gnat F.Mk.1, the proposed Mk.2 (with thinner wings, reheat and missile armament) might just be of interest. The Indians were not so lukewarm and wanted the F.1 right away. Yugoslavia and Finland were also seriously interested. The first flight of an F.1 was on 16th May 1956 from Chilbolton, and development continued quickly. However by then it was too late for Petter when it came to an RAF order - back in February the Air Ministry had stated that they no longer supported even the development of the Mk.2 and saw no use for the aircraft in UK air defence. Despite this they still funded the six development F.1s; they were also interested in the possibility of adding an extra seat to the Gnat and calling it a trainer. 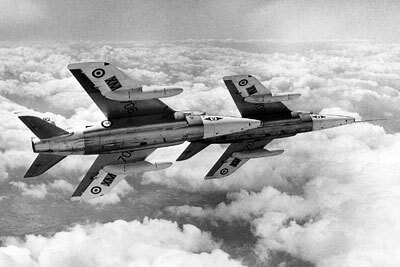 Folland responded with remarkable speed to this idea given Petter's intrasigence to modifications prior to this point, and produced a brochure outlining a trainer variant. This was accepted, again with remarkable speed - even before the F.1 trials had been completed. Strangely, the trainer version was designated as the T.1 - with the F.1 already in existence, and the F.2 simmering in the background, T.3 would have made more sense but this was not to be. Perhaps this was Petter's old trick of changing a designation only slightly while greatly changing the aircraft itself, in order to avoid bureaucratic delays? The Indians were by now also interested in a naval version of the Gnat but in an ironic turn of events it was found that the aircraft was too light - the catapult gear on the INS Vikrant, the Indian Navy's carrier, needed a 10,000lb weight minimum! With no UK backing for development of an improved naval variant with radar (which would have probably got it up past the weight minimum easily), these plans slowly fizzled out and the Indians bought Sea Hawks instead. This also meant that any possible sales of Gnats to the Canadian and Australian Navies were lost. Development of the F.1 proceeded fairly smoothly - certainly with none of the drama associated with the Swift and Hunter programmes - and though some problems were found, they were overcome without undue delays or expense. The most serious was longitudinal instability, which meant the joystick could become overly sensitive in certain flight regimes. Much experimentation eventually resulted in a complex gearing between the joystick and tailplane, thus producing in the Gnat trainer a rather unique control system that was to be the bane of many a student pilot's life. Petter resisted its introduction on the F.1, preferring to keep the aircraft simpler. Roll rate was found to be remarkably fast regardless of speed (greater than 360 degrees per second!) and limiters were introduced to prevent large scale aileron deflections at higher speeds. Even with the limits introduced, it was clear that the Gnat was going to be quite a fighter, and in trials against Hunters it consistently came out on top. 1957 arrived, and with it, the infamous Duncan Sandys' White Paper, cancelling a slew of defence projects. This wasn't so much a nail in the coffin of the F.2 as a final shovelful of earth on top! The Indians, meanwhile, had ordered 40 Gnat F.1s - 25 to be built at Hamble, and 15 to be delivered as kits for assembly by Hindustan Aircraft Ltd. (HAL) in India. 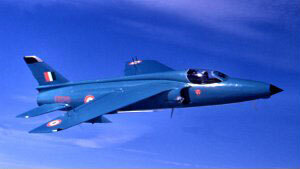 HAL would also license production to continue building the Gnat from scratch. The sixth and final development F.1 was given the Indian serial of IE1059 and flown to India in the cargo bay of an IAF C-119 (the Gnat's small size meaning that only the wings had to be removed for this flight) and was flown there in early 1958. Trials with the Gnat in India revealed some deficiencies not found in the UK trials and several problems, notably with the tailplane hydraulic system, had to be dealt with. HAL did well in dealing with the teething troubles and introduced several detail improvements to the Gnat including greater fuel capacity and bomb carriage on the outboard wing pylons. By May 1962 HAL had produced their first licence-built example and over the course of the next year slowly overcame the steep learning curve of building such an advanced type. 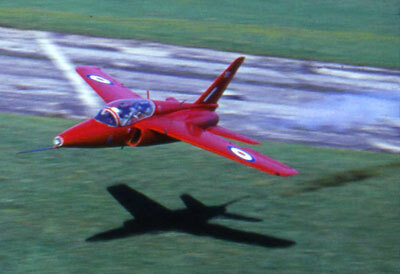 An order for 100 Gnat F.1s followed and production continued until the final example was delivered in January 1974. Folland also produced thirteen F.1s for Finland between 1958 and 1960, while licensing them to produce 20 in Finland itself. This wasn't to be, as after the crash of the second Finnish example a campaign was begun against the aircraft which was viewed in some quarters as unreliable. In Finnish service the Gnat was indeed modified repeatedly but given the advance on their previous equipment they did rather better with their first 'hot jet' than many other air forces, including the RAF! Finnish pilots liked the Gnat but the longitudinal instabilities did give rise to some concern and it had to be carefully handled. The final two deliveries were of a new variant, the FR.Mk.1, which included cameras mounted in the nose for reconnaissance duties. These were successful enough to prompt a study in 1965 into production of an improved FR.1 with more fuel and different camera equipment, but in the end this too went nowhere. The final foreign order was for a mere two examples for the Yugoslavian Air Force, delivered in June and July of 1958. One was written off in a belly landing after hydraulic failure and Yugoslavia went on to buy second-hand F-86 Sabres instead of proceeding with more Gnats. Meanwhile development of the T.1 proceeded. The take-off and landing distance requirements specified by the Air Ministry could not be met by the basic F.1 design, so a larger wing was required - and instead of large 'flaperons', seperate ailerons and flaps would be used. Fuel capacity was borderline and conventional drop tanks on underwing pylons adversely impacted performance and stability - the result was the slipper tank design, fixed directly to the underside of the wing. The most obvious area of change was of course the cockpit, which had the existing fighter style canopy and armoured windscreen replaced with a large clear canopy and fixed forward portion. As mentioned above the flying control system was also improved in the T.1, though its unique nature could give rise to problems on occasion. Learning the drills associated with the various system failures possible detracted somewhat from the general training duties of the Gnat, in that the student would never fly an aircraft with a similar system in the future! The ejector seats were also different to the seat in the F.1, being larger and based on the SAAB Mk.2 seat fitted to their J.29 'Tunnan'. One innovative feature of this seat was a safety lever rather than safety pins - in the 'safe' position the lever would dig into the pilot's neck if he tried to sit back, so it was always obvious if the seat was safed or not, and there were no worries about dropping safety pins into the cockpit. While a development batch of T.1s had been ordered in 1958, the order for production examples did not arrive as expected. Many at Folland were of the opinion it was deliberately held back by the government to force them to accept a take-over by Hawker-Siddeley - part of the government's plan to rationalise the various aviation manufacturers into a far smaller number of larger companies. 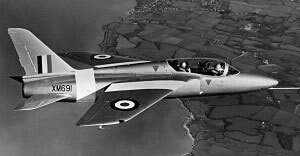 In August 1959 the first T.1 development aircraft flew and once Folland had been swallowed by HS, the production order duly arrived, with 30 ordered in February 1960. A second order for 20 more was placed the next year and by June 1962 the first production example had flown. Entering service later that year, the Gnat encountered a few teething troubles at first but as modifications were incorporated into the production run to reflect improvements made to the F.1s being produced for India and Finland, reliablity improved. Maintainers found it a little tricky to work on due to the confined spaces in which much of its equipment was hidden, and the small size of the type also contributed to a few unfortunate injuries when taller pilots had to eject - leg and knee injuries being caused. Taller pilots were soon forced to train on other types to avoid further such incidents. Despite all this however most pilots found it a joy to fly with excellent performance and manouevrability - a much 'hotter ship' than the Jet Provosts they carried out their basic training on. From the instructor's point of view it wasn't quite as much fun, with the view from the rear cockpit being seriously restricted, along with the amount of shoulder and headroom! 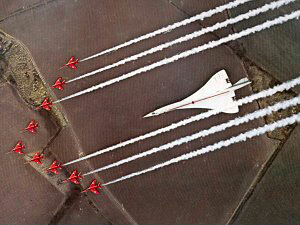 The Gnat found fame with its participation in aerobatics - first with the Yellowjacks team who displayed during the 1964 season, and then with the Red Arrows, formed later that year and making their first public appearances in 1965. 10 aircraft were permanently assigned to the Reds - seven to fly with three spares (later to be increased to eight, then nine flyers with just the one spare). While initially based at RAF Little Rissington, they would soon move to RAF Fairford and then, in 1966, from there to RAF Kemble which would be their home for the next 13 years or so. The Gnat was considered to be an excellent aerobatic type by the Reds they soon became the RAF's premier display team and a firm favourite with the public. Serving with 4 Flying Training School at RAF Valley for 16 years, the Gnat gave steady and fairly reliable service, though as the well-used aircraft got older more effort was required to keep them airborne as fatigue reared its ugly head. As a trainer, it had some flaws, including a selection of emergency drills which would only ever apply to the unusual systems found in the Gnat, and as a result trainees wasted much effort memorising drills and coping with problems that could never develop on another type - in effect, the Gnat was training you how to fly... a Gnat. The Gnat's rather more versatile replacement - the Hawker-Siddeley Hawk - entered service in 1978, though the Red Arrows did not upgrade to the new type until 1980 and the RAE continued to fly a single Gnat for a few years past that. Many Gnats spent the years after retirement as ground instructional airframes, or ground handling trainers, before many of these were then disposed of to civilian owners. A large number of these can be found in airworthy condition throughout the world and several have found fame in retirement too, in movies such as 'Hot Shots!' and 'Hot Shots Part Deux'. 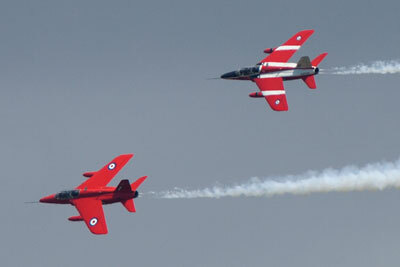 They are regular performers on the UK airshow circuit and popular with those who want a cheap(ish) 'hot ship'. Sadly a small number of Gnats have been lost in civilian hands, mostly in the USA. In the UK, one was reduced to a static exhibit after a belly landing and Gnat Display Team pilot Kevin Whyman lost his life in the crash of G-TIMM in August 2015. 450 knots, 0.95 mach 0.968 mach 525 knots at sea level, 0.95 mach ? ? ? 48,000 ft ? ? ? 1,180 miles ? 3,455 lbs 4,604 lbs 5,560 lbs ? 4,902 lbs 8,700 lbs 9,520 lbs ? 20.33 ft 22.166 ft 24 ft ? 126.6 sq ft 136.6 sq ft 175 sq ft ? 29.25 ft 28.58 ft 31.75 ft ? HAL also produced their own two-seat trainer version of the Ajeet, but only two prototypes and one further example were produced as the Gnat was phased out of service before trainer development had been completed. Corrections and gap-filling welcome as always!